In what is rapidly becoming a Columbus Day weekend tradition, Dale and Lacey Castro, a husband and wife from Lewiston, Maine, bested 41 other couples to take home the 10th annual North American Wife Carrying Championship title. The race, over a 287-yard obstacle course, requires the man (or woman) to carry his or her wife/husband over a series of obstacles. Whoever gets the fastest time takes home the top prize. Dale navigated the course in a blistering 54 seconds despite carrying 97 pounds of Lacey on his back! 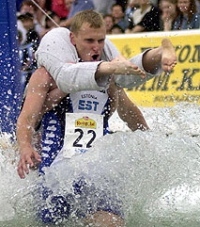 The next stop for the couple might very well be the World Wife Carrying Championship, which is held every year in Sonkajärvi, Finland. The sport originates from Finland, but has proven very popular throughout Eastern Europe thanks to its award of the wife’s weight in beer (and five times her weight in cash in the US version of the contest). Dale and Lacey, given how quickly they navigated the course, could be the first US team to win the title should they travel for the event next year. No word on whether or not polygamists can pick their lightest wife to carry, but so long as she meets the minimum weight requirement, she’s fair game whether or not you’re married to her. (Yes, there are rules to this contest.) Let’s hope Dale and Lacey Castro bring home a title for America!